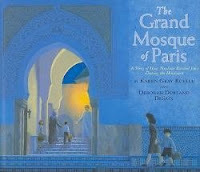 The Grand Mosque of Paris: A Story of How Muslims Rescued Jews During the Holocaust by Karen Gray Ruelle and Deborah Durland DeSaix. Grades 3+. Holiday House, August 2009. Copy provided by my lovely library. From 1940 to 1944 during the Nazi occupation of Paris, no Jew was safe from arrest and deportation to a concentration camp. Few Parisians were willing to risk their own lives to help them. Yet during this perilous time, many Jews found refuge in an unlikely place: the sprawling complex of the Grand Mosque of Paris. Not just a place of worship but a community center with gardens, apartments, a clinic, a library, and even a restaurant, this hive of activity was in ideal temporary hiding place for escaped prisoners of war and Jews of all ages, including children. Talk about armchair traveling. This beautiful picture book tells a little-known story shrouded in mystery. There is little documentation that proves that the Grand Mosque of Paris opened its doors to shelter Jews during World War II, but authors Ruelle and DeSaix have ferreted out what evidence they could and turned it into a compelling book. This is a touching story: Muslims reaching out to their Jewish "brothers" and protecting them even though it put them at great risk. It's a story that should be an inspiration to all of us and one that adds an interesting element to any Holocaust study. I have a few complaints about format - the text is, for the most part, presented in large blocks which didn't lead to the easiest reading. I wish it had been broken up a bit more. And I wish the authors had included actual photos of the Mosque or a diagram of its layout (even as part of the author's note). That said, it's a compelling story and the artwork is beautiful - pale blues, purples, and grays. The book is rounded out with a glossary, a resource list, and a lovely bibliography. In the afterward, the authors explain how they researched such a clandestine operation. This is an interesting book that will definitely lend itself to units on the Holocaust and multiculturalism. Happy Nonfiction Monday! Check out this week's round-up at Practically Paradise. i'm with you. the artwork is just lovely, and it's such an interesting story, but the text looks so dense (even to me, an actual grownup with an interest in the subject matter) it's gonna be a hard sell to kids, i think.